Tacky Living: Laura – may I call you Laura? – you already had an inspirational body of work to your credit before creating the Garbage Collage. Your minimalist yet tactile “GroutMan” series, your coffee ground -n- hair soaps which stimulate so many disparate senses – the list goes on and on. You’ve mastered a mind boggling array of media, adding your own unique stamp to each one. Yet this particular piece is a bit of a departure, even for you. Exactly how did you get started working in garbage? Laura: Why don’t you just call me LM. That’s how they always do it in magazines. I had a project to do for a collage class – to express one of my favorite poems in the form of a collage. Immediately I knew I’d be illustrating Shel Silverstein’s “Sarah Cynthia Sylvia Stout Would not Take the Garbage Out.” I spent the first week trying to think of how to include “gloppy glumps of cold oatmeal” in an everlasting form without chasing my dog-nosed husband out of the house or having to replace the carpet anytime soon. I wondered about laminating rotten peas, of preserving curdled milk in a pour of Plexiglas, of actually buying one of those special $19.95 gizmos advertised on TV to seal a plastic bag at any point across the top just so I could preserve these organic and highly meaningful items. And I considered just using exactly everything as it was, taking a quick picture, and tossing it in the trash can. So literal representation was turning out to be too hard. Then I noticed in the trash some ties from an old jacket. And I saw big sturdy pieces of cardboard – packaging from a newly purchased garden hose – ready to be trashed. I could see the possibility of the ties woven through the holes in the cardboard. Then I started searching for more trashed items that I could tape or tie to this trashy skeleton structure. I thought for sure I’d have to go to my neighbors to get enough trash to complete this project but after three hours, I had a string of trash long enough to encircle a school cafeteria table and decided that was enough. So I saved my friendships with my neighbors. And all my politically correct art classmates know that we eat pop tarts. Tacky Living: My goodness – isn’t that impressive! Tell us, where is the sculpture being displayed now? Where could we go to see it? LM: I gave the collage to a second grade teacher friend of mine who hung it in her school’s auditorium. The first thing she noticed was that I had taped Pokemon cards to my trash artpiece. I didn’t know what they were. She said the kids would be dying to grab them off. One person’s trash is definitely another person’s treasure. I suggested she let them take the cards off if they replaced them with some other garbage. She rolled her eyes and I backed off and left it completely up to her discretion. Tacky Living: That sounds like a good idea. Kids have no business interacting with a work of art. 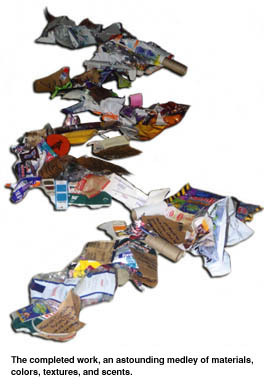 What inspired your choice of garbage items to include in the collage? LM: Anything I could tape, that wouldn’t stink in three days, and anything I could haul in my truck to some unsuspecting place for display. Tacky Living: Which were some of your favorite items to work with? LM: Colorful stringy things . yarn, used pieces of fabric with their edges coming apart. Tacky Living: I know that artists are very particular about their materials. How did you acquire the garbage? Did you use just anyone’s garbage, or is it special garbage? LM: I went from room to room scavenging through all our trash cans, avoiding those full of used tissues and chicken bones. Tacky Living: We can all see the obvious meaning of the linked bits of garbage juxtaposed with the classic Shel Silverstein poem, but what is the piece’s deeper meaning to you? LM: I paid less for my trash pickup that week. If I can find 51 more places this year to hang like works, I won’t have a trash bill. 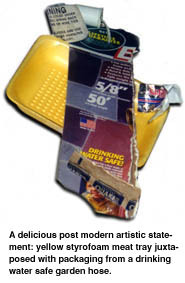 Tacky Living: There’s one section of the collage that makes a deliciously ironic Postmodern statement – it’s the sequence where you’ve juxtaposed the cardboard from the water hose packaging with a brilliant yellow meat tray! What do you think of that guy who paints with feces? LM: Hope he doesn’t have a slip of the brain and forget he’s not icing a chocolate cake. Tacky Living: What would your mother’s neighbors think of your latest work? LM: Heck, I don’t even know what my mother would think. But I don’t think her neighbors would like it given its poor fit with their Holly Hobby decor. Tacky Living: Is there anything especially intimate and embarrassing that you’d like to share with the readers? Or perhaps we should just give them a list of what we’ve found in your garbage that didn’t make the collage? LM: Gee, I love sharing intimate and embarrassing personal stories but I can’t think of anything right now. 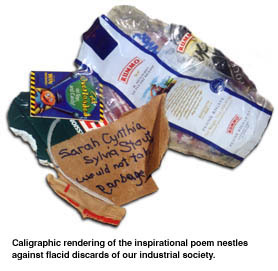 Maybe when I write my own version of this poem when Sarah grows up to be 35 and has adult garbage to throw out, I’ll construct a new collage. Then maybe I’ll have some stories to tell. Tacky Living: How much will you pay us not to publish this information? LM: I’ll take back my 51 latest works off your front lawn.